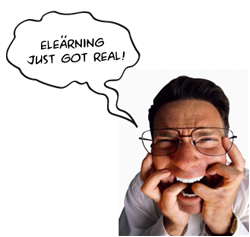 Let’s face it, no one takes compliance e-learning seriously. Slide after slide, learners glaze over the rules and regulations while unconsciously clicking the next button. The problem is that most compliance e-learning uses the same visual and narrative voice across all their courses. That’s like using the stop sign for all roadside communication. The reality is we use different voices every day. For example, I use one voice when my 2-year old is about to spill her water: “Ellie, remember both hands with the water” and she usually adjusts. I use another, more direct voice when she spontaneously beelines into the street during our walks: “ELLIE STOP!“ It’s all about the context and the message. That’s why I’m proposing a more direct, in-your-face approach to compliance training. Something more uncomfortable than what’s currently found in most of today’s sanitized, polite and generic compliance e-learning. 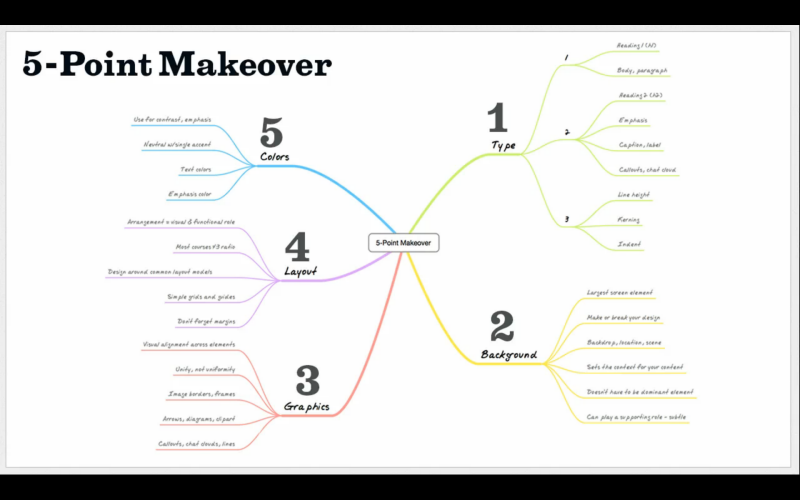 Let’s look at some slide makeover ideas you can apply to your online training. 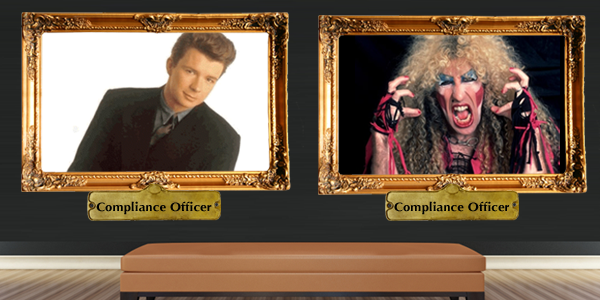 Select the fictional compliance officer for whom you’re least likely to pad expense reports. Without knowing either Rick or Dee, I’m inclined to perceive Rick as more lenient and forgiving. 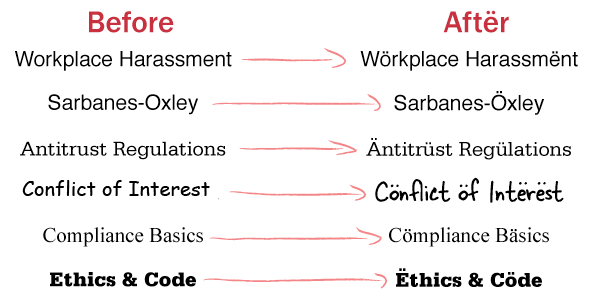 As e-learning designers, we can play off these perceptions to create e-learning worthy of a parental advisory label. Metalheads have long recognized the sense of power and toughness umlauts create. Some of the most feared rockers use the dots: Mötley Crüe, Motörhead and Spın̈al Tap are just a few examples. But umlauts aren’t just for rockers. Umlauts are also an effective way to get your learners to pay attention. Because they’re unexpected, they force your learners to take a second look. 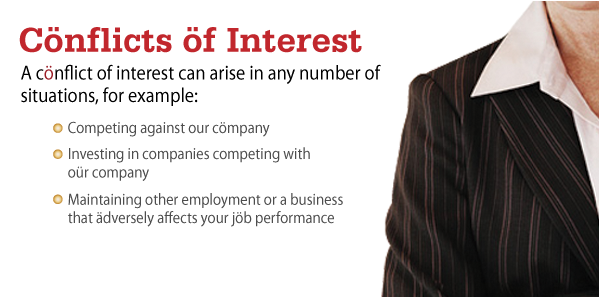 Use umlauts for titles, headings and strategically emphasized body text. It doesn’t matter that the umlaut lacks phonetic value. Here’s a typical slide, appropriately styled with Heading 1, 2 and bullet rules. The design is balanced, but it feels like I’m reading my company’s ethics manual. Already something’s different. Learners remain on the slide longer than before. The umlauts in the Heading 1 act like tractor beams that won’t release until the slide is committed to long-term memory. Most learners are so focused they fail to notice the next button. Push your learners over the edge by applying umlauts to consonants! Caution: Umlautization should be used sparingly to achieve the greatest effect. When you consider that most e-learning courses use the same fonts for every type of course, it’s no wonder learners don’t take compliance seriously. Every font has a unique voice and personality. The better you align your visual voice with your learning voice, the better the return on your courses. 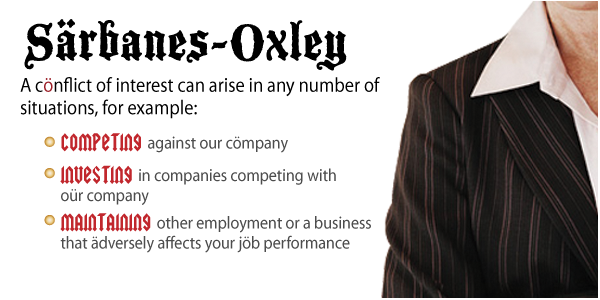 If you’re going Metal on your compliance e-learning, there’s no better type voice than gothic and blackletter fonts. What a difference a font makes! Here we used Blackwood Castle for our Heading 1 and Squealer for emphasis in the unordered lists. 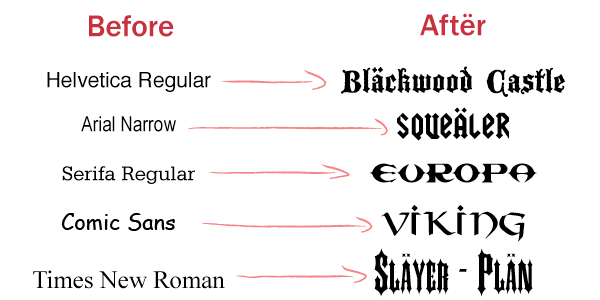 Blackletter fonts are designed for titles, headings and emphasis words or short phrases. Your content should be set for readability, so find complementary body text. I like Franklin Gothic and Bell Gothic for example. Fonts such as Futura, Century Gothic should be avoided unless you’re going for more emo designs. And even then it probably doesn’t work. 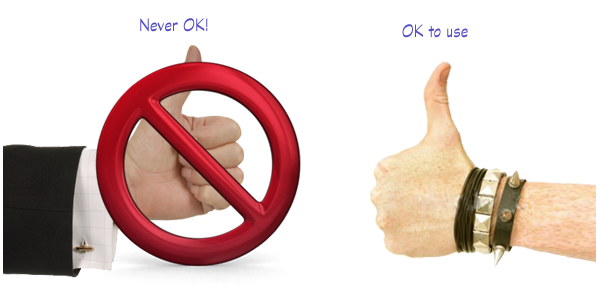 I’m sorry but thumbs up doesn’t cut it any more. I give my 20-month old the thumbs when she puts her sunglasses on by herself. It’s not the message you want when your learners earn 90% or higher on their annual ethics certification assessment. Not even close. 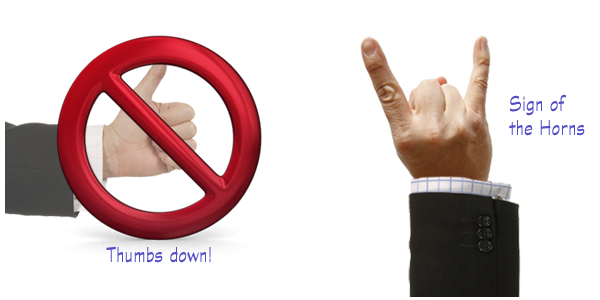 When you truly want to validate your learners’ performance, give them something meaningful like Sign of the Horns. First, let me say the suit jacket-Horns combo above totally works. But there will be times when you’ll need even more metal with your Horns. One way to achieve greater metal is by taking a sleeveless Horns in the Air photo and layering a suit jacket over the arm, just low enough to view the accessories. The following example should remove any lingering doubt about which method sends the strongest message. Be honest with yourself here. Could you pull off a fist bump? 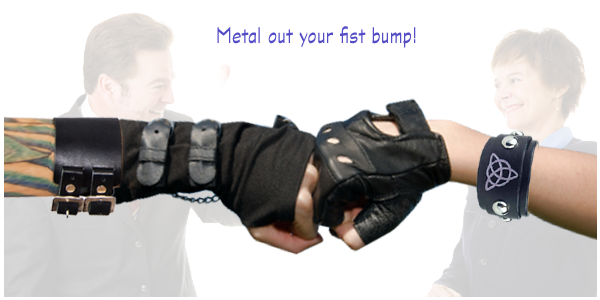 I’ve seen very few stock photos demonstrate authentic fist bumps. 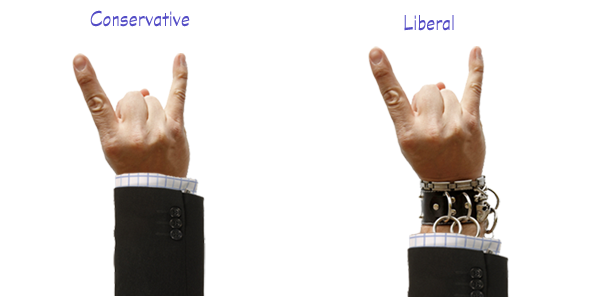 For those of you wondering, the middle finger is the opposite of Horns in the Air. While the finger can be effective in ILT and blended programs, it’s unproven in e-learning. Best to avoid for many other reasons. Horns mean different things to different people. They could be too edgy for some learning audiences. 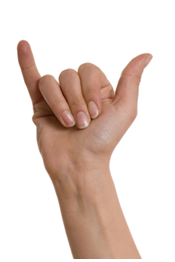 It’s perfectly acceptable to substitute Horns in the Air with the Shaka sign. The ultimate goal here is to get away from overused stock photography. Horns in the Air go best with the rocker growl. Not an easy technique and certainly beyond the scope of this article. But once mastered, the growl adds the perfect vocal emphasis in your compliance courses. Post-its, index cards and other office elements are the foundation to every designer’s toolkit. They’re essential because they’re familiar and versatile. Because note cards and similar items are so common, they’re not the best choice for serious compliance training. One sure-fire way to send strong compliance messages is to ditch the flimsy notecard and use tattooed knuckles to communicate chapter and heading intros. What’s wrong with this slide? For starters, the manicured nails and high-quality business card don’t communicate, “Fatality – Up Next!” like an OSHA course should. In fact, the message here is less about workplace safety than it is personal grooming! Did you notice how the first image pulled you closer to your monitor while the second image pushed you back? This is by design. Size and composition affect how each image communicates. In the first example, everything is in focus and the text is safely set with generous whitespace in the business card. In the second image, the fist is nearly filling the height of the image and it’s the only object that’s in focus. The man and his arm are blurred giving this a strong portrait effect. There’s also less whitespace around the letters which contributes to the tension. If we wanted to update the first image, we’d enlarge it or crop it closer around the business card, increase the font size and use a heavier font and blur everything behind the business card. 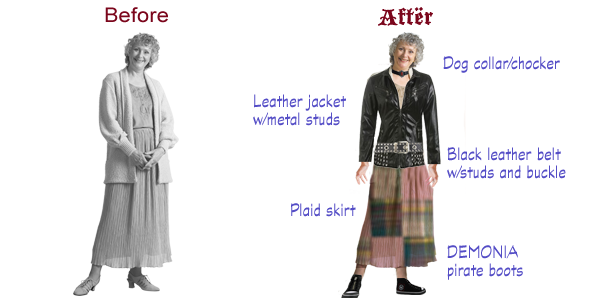 This last example is really about expanding and modifying existing stock photos. The reality is we don’t always have the option to buy new photos to get the compliance edge we’re after. Let’s look at some essential metal design elements and how they can be used to toughen up existing photos. By no means is this a complete list of objects, but it’s a great start for modifying existing photos. Using a few of the elements, we’re quickly able to convert the Before character into someone learners will obey! Most images aren’t effectively communicating what the designer intends them to communicate. Stock photos are essential, but they’re most effective when used as a starting point rather than one-size fits all. 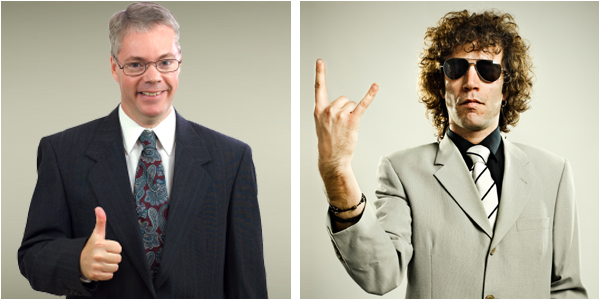 So, do you have what it takes to start rocking your compliance e-learning? Does Dr. Werner approve of this post?? Love it! Great job of communicating the importance of getting away from the usual “business” stock photo images. Sites like iStock are so packed with the business shots that it’s just easier to use the same boring images and themes which does nothing to get the learners attention. 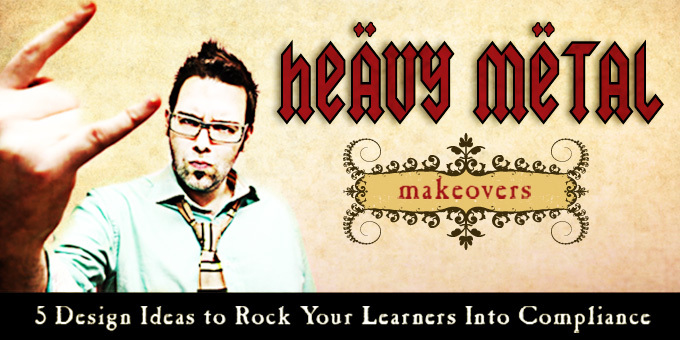 Adding some “edge” to the theme like you have done with the rock star theme goes a long way towards winning the learners attention. Your ideas are great, but it helps when your employer/client shares your vision. I work for an equivalent of OSHA, but I know they would never go for those images. 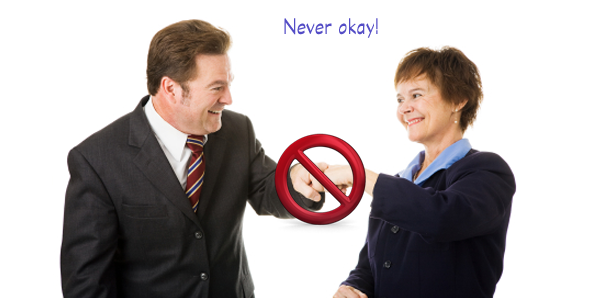 I put together some slides for a Violence in the Workplace webinar, I used some in-your-face photos of agressive people to get the viewers attention. They dropped my presentation in favour of bulleted slides because mine was deemed “too violent” and bulleted slides were safe (and boring). Maybe Bryan Jones of @elearningArt would be open to creating and selling a portfolio of photo images for Metal Compliance courses. Have you asked him? 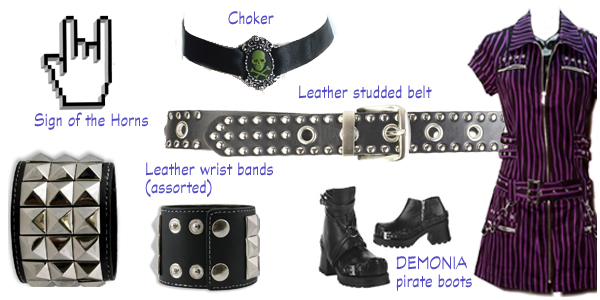 I like how you suggest simply augmenting our existing image libraries with Metal accessories. That does help the e-learning budget in these economic times. @Robert – Dr. Werner Approved – always! @Joe – thanks Joe! It’s all about keeping it fresh. Classroom facilitators have the advantage of adapting their live training to the audience. E-learning designers don’t have that option, so the element of surprise and unpredictably has to be designed into the course. @Jenise – thanks and this could be the next E-learning Art series? Maybe I’ll interview to be one of his hand models. I like how you think. I suspect the umlaut thing could get overdone quickly, but I am getting ideas about playing with some of the special characters available in other alphabets. .-= Tammi Kibler´s last blog ..Four Mistakes Sarah Ferguson Can Teach Writers to Avoid =-. Thanks, Tammi. You’re right about the risk of overdoing it. The main point is to create more visual surprise in our course designs. I’d like to know the other special characters you think would work. Will you share your links back in this thread? I only used ERASER typography once. It seems to be written with a chalk and it only has the “N” flipped. Rock on, Belen! You’re so right about being “safe” in training. People love looking at creative examples that use appropriate humor, design, and non-standard presentation models, but rarely do they build those types of projects for their own organizations. How in the world did I miss this post?? Sarbanes-Oxley, Rick Astley, and gratuitous umlaut usage all working together to help me create more effective compliance courses? I have no words. Only gratitude. I was wondering…did this come out in April? I hear April’s a terrific month for compliance. @Jackie: Believe it or not, this one didn’t come out in April. Words are not necessary in this case. Your gratitude is more than enough. David, could you say a few words about potential applications of the “M” hand sign (a symbol of the divine feminine in medieval art) and the Vulcan “V” symbol for “live long and prosper” for compliance training? I can’t get over how funny this is but not as funny as the sliced arm tutorial! Really enjoyed this post David. I just realised it’s one of your oldies! How did I miss it?